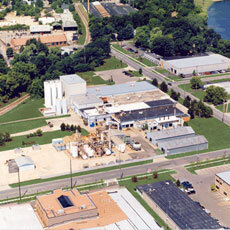 The VCF Films production plant, located in Howell, Michigan, manufactures thin films based on your custom needs. Located in southeast Michigan, VCF Films has been delivering innovative cast film solutions since 1963. Acquired by privately held PMC Global in 1974, we’re backed by the resources of a global company, while at the same time being encouraged to be entrepreneurial in every way. VCF Films is committed to perfecting and expanding the art and science of thin film manufacturing, producing cutting edge materials for your needs. From solar panels to medical probes, thin films are revolutionizing a wide range of industries and fueling new innovations around the world. With billions of dollars in new technologies and wide open markets riding on just a few microns of material, thin film quality has never been more important. At VCF Films, we’ve devoted nearly 50 years to delivering highly engineered thin film and coating solutions to industrial manufacturers, packers and converters worldwide. Our slot die coating process for producing polymer films is the most precise method of thin film manufacturing, yielding the world’s thinnest films that are pinhole and gel free across large batch runs, with optical clarity and dimensional stability unmatched by other processes or manufacturers. We work with a wide variety of polymers, solvents and additives to meet very specific customer coating and film needs in virtually every industry requiring critical components and tolerances. Polyimide and polysulfone films designed for applications that require high temperatures, such as flexible electronic circuit boards. Flexible polyurethane films range from ultra clear and ultra weatherable paint protection films to very flexible and hydrolytically stable medical grade films. Weatherable films include PVDF and acrylic for clear layers on a flexible solar panel or weather protective layers on signs. VCF can also add specialty fillers in high percentages, as necessary for carbon conductive films, flame resistant films and lithium ion battery coatings. VCF Films is dedicated to surpassing customer expectations through the development and commercialization of innovative thin film solutions, while creating an energizing and fulfilling work environment.